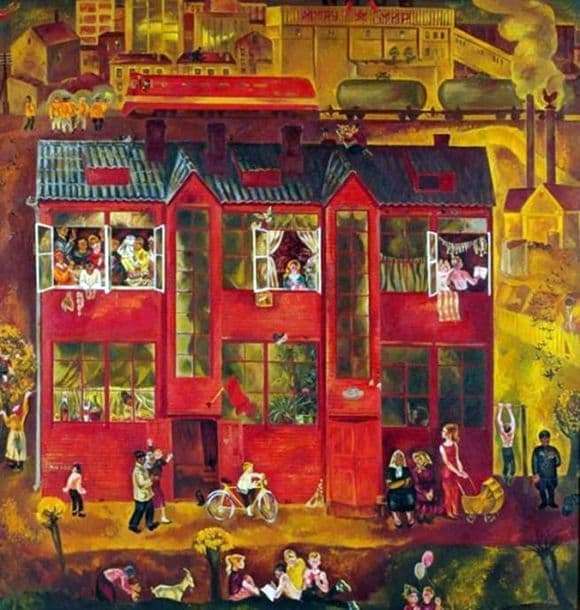 The painting “My Home” was created by the famous artist of the Soviet period, Vasily Fedorovich Sumarev, in 1972. The history of the creation of the canvas is quite simple and simple, as it depicts the home of the artist, in which he was born and raised. It was a post-war time, not easy for adults, but quite tolerable for children spending their days in endless games. The picture of the sun, filled with heat and light, in 1972, the emergence of such a picture was a real breakthrough in art, allowing you to break out of gloomy everyday life and look at the world in a new way. The film consists of several separate episodes, the central figure of which is an apartment building. The artist depicted the structure as it was remembered by him in childhood, but in a slightly embellished form. The real house was painted with ordinary paint for the floor and, most likely, did not cause such violent emotions that followed after the appearance of the picture in the world. At the very bottom of the picture, people are resting, children reading books, playing with balloons and carefully listening to the narrator. The animals are also present in the picture, in the lower left corner of the picture the artist depicted a woman, apparently trying to milk the goat. The windows of a two-story house shine with clarity and transparency. The window sills of the first floor are decorated with flowering indoor plants, on the second floor you can see a lot of people, some of whom celebrate the wedding, while others are engaged in hanging fish on clothesline to dry. Parents with young children, old people, young people walk in front of the house, ride bicycles and play ball. Such ordinary scenes are characteristic of the day off, which is also indicated by the presence of linen hanging on the clothesline and the idleness with which the vacationers walk. In the background, the picture shows a railway with a train traveling along it. Also in the background you can see a small group of people, a shop and an apparently small plant with smoking pipes. The canvas is written in a realistic style, its first version was created in 1969. The picture so struck the Soviet viewer with its simplicity that there were practically no those who could criticize it.